The New York Times sold out today in the city's rush to score election-day commemorative copies. As an informational tool, the internet is be awesome, but as a souvenir of history in the making, it just doesn't cut it like a paper-and-ink newspaper. It may have posted an 82 percent decline in year-on-year profits back in summer, but today, people just can't buy the New York Times fast enough. Gawker reports that most of the city has literally sold out of newspapers due to folks snapping them up as souvenirs of this historic day (the cover is fairly arresting), prompting New Yorkers to line up outside the broadsheet's 40th Street headquarters to get a copy. So as it turns out, all you need to do to keep print alive is witness history being made (not concoct fancy new gimmicks like, say, the Word Train). Subscribers and early-morning buyers, it might be time to consider eBay. 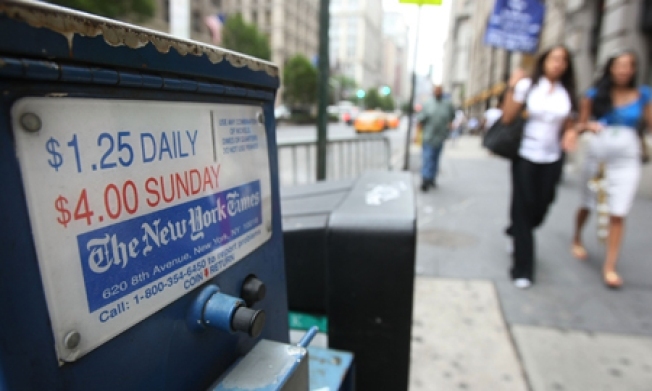 UPDATE: The Times to print another 50,000 copies of today's paper, says Gothamist. Cha-ching!